Accurate, reliable and gentle, the SP Planter Series are available as trailed or mounted and in either 2, 3, 4, 6, 9 and 12 row quad planting models. 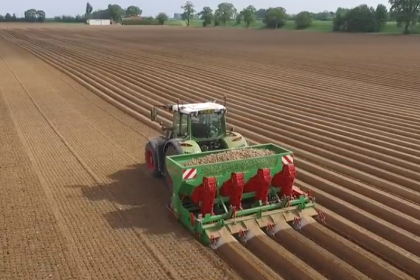 The Standen SP330 Potato planter is a gentle, accurate and strong 3-row planter which offers precision planting by accurate cup feeds, accurate depth control promoting uniform crops and effective seed singulation preventing double planting. The Standen SP600 is our 6 row model from the SP Cup Series of Potato Planters. This model has folds hydraulically fro safe transportation but still offers all the advantages of the SP Seriers of planters. The Standen SP440 Potato planter is the 4 row planter from the Standen SP Cup Series Mounted and Trailed Potato Planters. As with all of the SP models in the Standen planter range this product offers precision planting, accurate depth control and effective seed singulation. A BASELIER Planter / Cultivator Combination available from Standen Engineering.